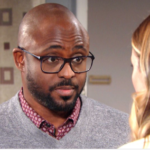 ‘Bold and the Beautiful’ spoilers impart that although the integration of baby Phoebe is going smoothly, Zoe is starting to suspect her father’s behaviour more and more. She has a meeting with Flo that only helps raise more suspicions. If you missed B&B, here’s what you need to know. At Forrester Creation office – Liam Spencer (Scott Clifton), Hope Logan (Annika Noelle), Eric Forrester (John McCook), Brooke Logan (Katherine Kelly Young), Pamela Douglas (Alley Mils) and Quin Fuller (Rena Sofer) are all in the office for Liam and Hope to welcome them back. Pamela invite them to eat their favorite cake. Everyone wants them to know how much they’ve been missed and how sorry they are. Hope receives cards from everybody. Eric tells her that coming back to work is a big step and he wants her to feel as welcome as possible. Quinn wants her to remember that she has a strong system of support here. Eric is grateful to Liam and Hope for what they did for Forrester Creations and they deserve all the attention they can have. Everyone is gonna be supportive and attentive to their needs. They can start right away or they can wait, it’s really up to them he says. They should remember that they are surrounded by people who just want what’s best for them. Hope has helped so many people with her line and now it’s time to get back some of what she gave. Quinn tells her that everyone is wondering how Hope reacted to Steffy’s adoption. Phoebe is a beautiful baby, Hope says. Eric tells her that it was very brave of her to go and see Phoebe. Hope’s very happy about the adoption. Phoebe is like an angel. She will bring lots of joy to everyone and she’ll get all the love. Quinn and Eric welcome her back again and tell her if she wants more time they will understand. They are ready to get into their routine and in her line. Eric tells her that Ridge and him want her to go back with her line ”Hope for the future”. Not only that but they will increase the budget and will put additional resources to her collection. Hope is amazed and happy. She can’t believe her ears. No one told her anything because they didn’t want to put pressure her to come back. Her line brings an energy and a spirit that the company absolutely need. Hope is speechless. Eric tells her they will follow her lead. If she wants to work he will give her more than she can do, but if she wants to stay longer they will understand. What’s important for her to know is that they are all there for her, says Brooke. Hope, Liam and Brooke are alone now. Hope doesn’t know where to start. Brooke tells her that if she needs more time it’s ok. It’s not this, she says. It’s that last time she was in this office she was pregnant with Beth. Now she’s sad and doesn’t know when this sadness will disappear. Going back to work is not gonna make her sadness disappear, but it might help a little bit. At Steffy’s house – Taylor Hayes (Hunter Tylo), Ridge and Steffy Forrester (Jacqueline MacInnes Wood) are together. Taylor and Ridge are arguing on the amount of time they are keeping Phoebe in their arms. Ridge is grateful to Taylor for making the adoption possible with her contact. He likes the family that Steffy has now with her new baby, Phoebe. Taylor tells Steffy that she can go and have a nap, she and Ridge can watch over the girls. Steffy appreciates the offer, but every moment spent with them is a blessing, especially now after what Liam and Hope are going through. Ridge asked Steffy how Hope and Liam did there. It was emotional, especially for Hope, but after all the pain and loss, she thinks it was good for her. Phoebe seems very comfortable in her arms. Hope can play a very important part in Phoebe’s life, Steffy says. Ridge says that adopting a child was a little crazy. It was a bit of a challenge so quickly after Kelly. Steffy wasn’t sure she could adopt so fast. It was Taylor’s contact that helped her find a solution so quickly. She knew from the moment she saw Phoebe that she was gonna be her baby. The only thing she wasn’t sure about was whether her biological mother was gonna change her mind. Steffy thanks her mom and her contact for helping her so fast. Ridge is curios about Phoebe’s mother. He didn’t have a chance to meet her. He finds that Liam should be more involved with Phoebe and Kelly. Taylor agreed, she feels the same way. It’s a shame that Steffy has to do this on her own. Steffy came with Phoebe in her arms. She’s telling to Taylor and Ridge that she hopes Phoebe knows how much she loves her. She wants Phoebe to feel that she’s safe and cared for. She might not be her biological mother but they are a family. At Forrester Creation shop – Zoe Buckingham (Kiara Barnes) and (Ale)Xander Avant (Adain Bradley) are talking about Hope. They know everyone is gathered to welcome her back. Losing their baby had an impact on her dad too. A part of her father going back to London is because of that, but there was something else even before of that. She hopes she will find the answers by herself. She has the keys to his flat. She will go and see what’s there. Zoe is worried about him. Leaving the way he did makes her worried. Maybe she will find something to understand what’s going on with him. Her father was deeply affected by the loss of Hope’s child, but there was something else going on. It’s strange also the fact that he kept secret where he was staying. Zoe is determined to discover what was that his father kept secret. She hopes she will find something at his flat that will give her an idea. Xander tells her that she will find an empty flat. At Dr. Reese Buckingham flat – Zoe used her key and enter in her father flat. Nobody was there but suddenly Florence Fulton (Katrina Bowden) walks in. Zoe asks her who is she and what she’s doing there. How is she involved with her father, she asks.